RICS School of Built Environment (RICS SBE), Amity University has placed 100% of its second batch (2014-2016) of MBA graduates in leading Indian real estate, construction, consulting firms and banks. The average CTC offered to graduates is Rs. 7.2 lakhs, and the highest offer is Rs.18.2 lakhs. This year saw participation from prestigious middle east recruiters which together offered jobs to 29% of the eligible batch. Companies like Al Naboodah, Al-Futtaim Carillion, SPCL Dubai, Faithful + Gould, Dubai and Laing O’Rourke, Dubai offered construction and quantity surveying job roles to our graduates. With placement commitment of many employers from day one, a testament to the strength of these industry-led specialized degrees was 100% placements offered by 34 companies to the first batch last year. The quality of talent produced at this specialized institution has created a positive word of mouth in the industry. This year, the best brands in business fought their space to recruit the best talent on day one. 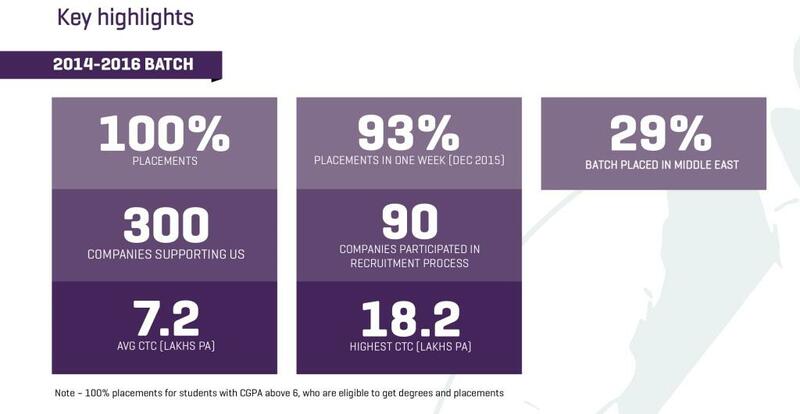 About 90 leading companies actively participated in the campus placement that begun in mid-November 2015. These included renowned firms including real estate developers, global and domestic real estate consulting, construction consulting, banks and housing finance institutions, construction firms, private equity funds, facility management firms and global investment banks. Top recruiters include – KPMG, JLL, HDFC, Colliers International, Cushman & Wakefield, Sotheby’s International, TATA Housing, MCHI – CREDAI, Mahindra Lifespaces, Ambuja Neotia, Godrej Properties, SARE Homes, Turner & Townsend, L&W Construction, AECOM, SYConE CPMC, Shapoorji Pallonji, Leighton India Contractors, TATA Consulting Engineers, amongst others. Job roles were diverse, ranging from investment advisory to research, valuations, transactions, housing finance, business development, sales and marketing for MBA REUI graduates and project planning, project management, quantity surveying, project innovation, commercial & contracts for MBA CPM and MBA CEQS graduates. RICS SBE, Amity University was established in 2013, in response to a strong call from the industry for specialized professionals in built environment. It is supported by more than 300 global and leading Indian companies that have committed to hire for internships and final placements. The institution equips students with techno-managerial skills through its specialized BBA & MBA programs in Real Estate, Construction Project Management, Quantity Surveying, and Infrastructure Management and PG Diploma in Facilities Management. For more details, see placement report. RICS School of Built Environment, Amity University has been set up to serve as a modern world class institution, to deliver quality education to students and aspiring professionals and also to serve as a hub for research and development of technical expertise in built environment. The School is an industry led academic institution, supported by leading real estate, construction and infrastructure firms, as well as the Ministry of Urban Development, Government of India. Set up in response to a strong call from the industry to address the challenge pertaining to the shortage of skilled professionals, the School aims to bridge the skills gap by delivering industry ready specialized professionals.